Seven local sites that act as spiritual pilgrimage destinations. Seven spiritual sites for local pilgrimage. By Ron Cassie and Lauren LaRocca. In an ever more digitally connected world—one in which we check our phones and email while still in bed each morning—it has become increasingly necessary to reconnect to ourselves, to our spirituality, and to nature. Baltimore's churches, synagogues, and temples—the anchor institutions of the historic immigrant and migrant neighborhoods—have traditionally been the places where people pray, reflect, and take refuge. Today, many serve as venues for 12-step programs and community gardens in addition to religious services. While religious attendance remains the conventional source of spiritual sustenance, pilgrimage—whether to a favorite hiking trail, garden, art museum, cemetery, stupa, or meditation center—also endures as a vehicle of spiritual nourishment. Deep in our DNA, and in our hearts, is a capacity for awe and reverence. Our early human ancestors honored the departed with ritual burial. The world’s first religious practices, as well as the oldest known cave paintings, showed nature itself to be holy. Standing dignified and opened-armed in Sharp-Leadenhall is an English elm believed by some to have been planted by Frederick Douglass, who sang in the choir at the nearby Sharp Street Memorial United Methodist Church before he escaped from slavery in 1838. 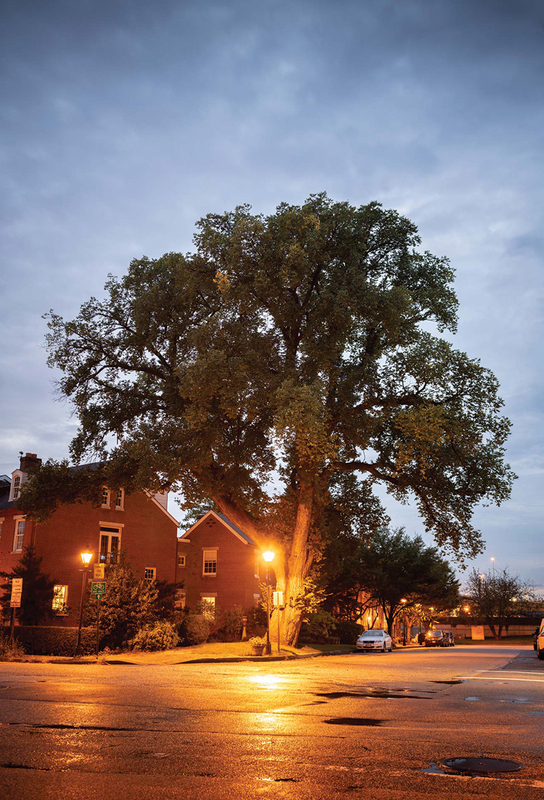 Not in doubt is that Douglass, who returned many times to the city and built a handful of rowhouses in Fells Point, delivered a speech in the shade of the massive tree some 40 years later. 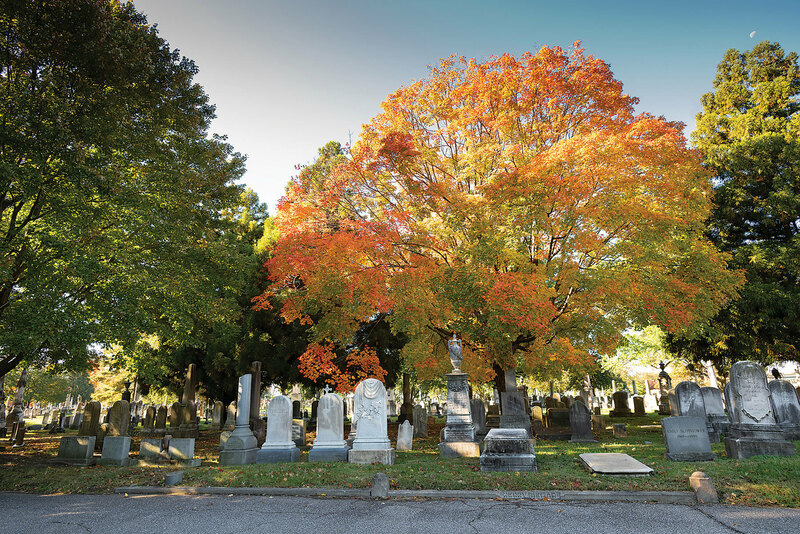 Baltimore is also home to dozens of other notable trees, including a descendant of the deceased 450-year-old Eastern Shore Wye Oak at the Cylburn Arboretum and a collection of oak trees known as the Grove of Remembrance in Druid Hill Park that honors those who fought in World War I. 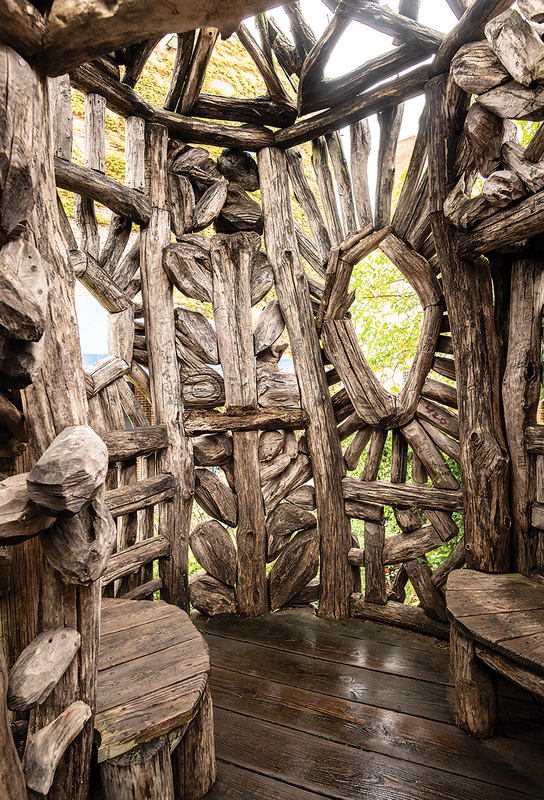 Beyond the wonders inside the American Visionary Art Museum’s three buildings lies an outdoor installation constructed entirely with found wood: the Meditation Chapel, made by eco-conscious wood sculptor Ben Wilson about 15 years ago. It was designed so passersby can literally climb inside the work of art and use it as a meditation hut. When outsider artist Gerald Hawkes passed away, a large ceremony brought busloads of family and friends to the Meditation Chapel for a ceremony to spread his ashes there. He was the first person to ever walk through the museum doors on its grand opening in 1995 and exhibited his matchstick sculptures there. “Several other people have contacted us, wanting their ashes here, too,” says AVAM founding director Rebecca Hoffberger. The chapel is closed this winter for repairs but will reopen to visitors sometime next year. 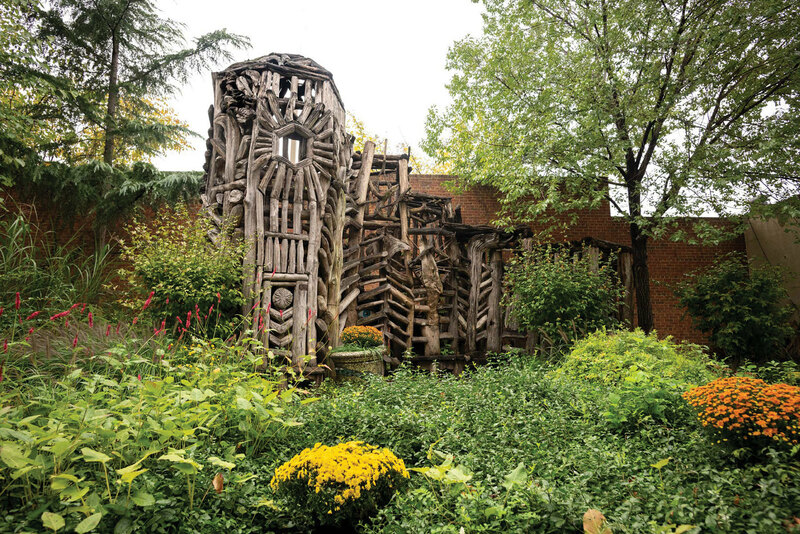 The spacious, rolling grounds at Green Mount host a trove of timeless art, including works by renowned Baltimore sculptors William H. Rinehart and Hans Schuler. Founded on 60 acres of the former country estate of Robert Oliver in 1838, it’s also one the earliest rural garden cemeteries in the U.S., a movement that spoke to the health concerns presented by crowded city church cemeteries, as well the Romantic period’s ideals, which glorified nature and the past as a respite from quickly industrializing urban life. 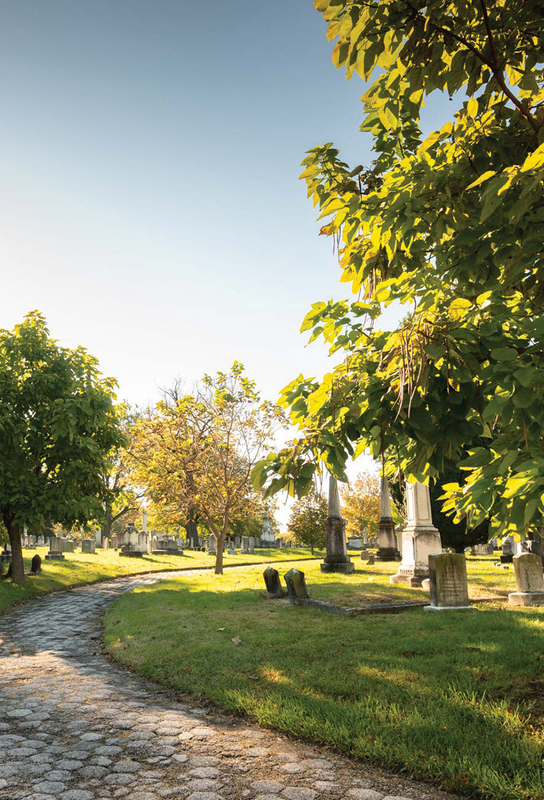 Green Mount is the final resting place for more than 65,000 people, including the poet Sidney Lanier and philanthropists Johns Hopkins, Moses Sheppard, and Enoch Pratt. Walking tours, which still provide that sense of respite and tranquility, occur in May and October. Sitting in the light that fills the Baltimore Basilica each afternoon is an experience unlike that at any other church in the city. 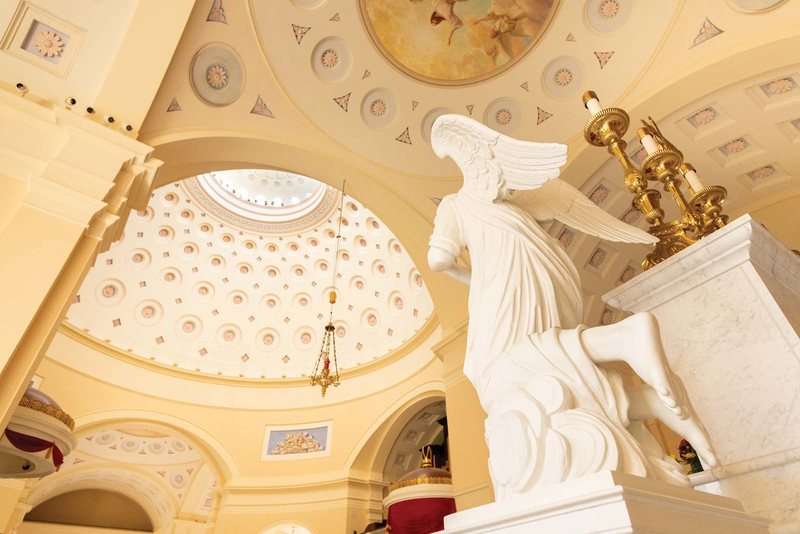 Considered architect Benjamin Latrobe’s masterpiece, the first Roman Catholic cathedral in the U.S. is a sharp contrast to the chambered, darker Gothic cathedrals of European tradition. 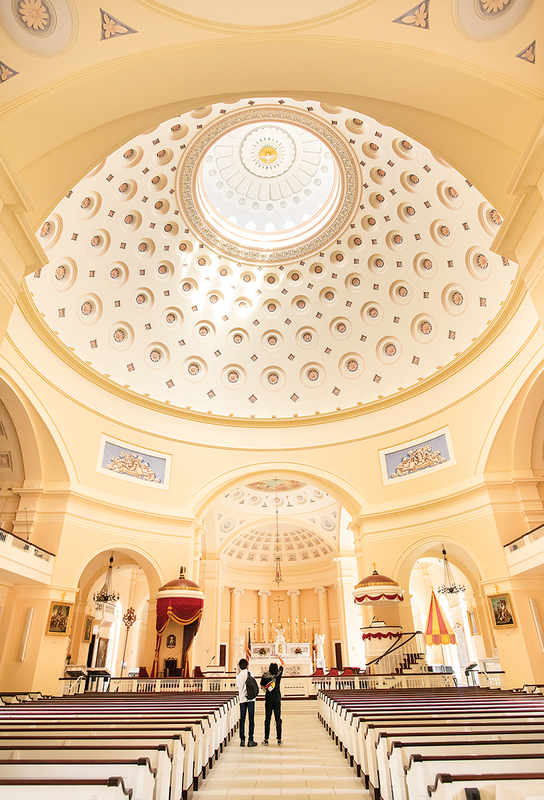 The 69-foot main dome’s 24 skylights and the church's towering side windows—no stained glass here—bask the entire sanctuary in a feeling of openness and warmth. The first Beth Tfiloh congregation was formed in Forest Park in 1921 and, representing a wide range of observance, grew into the largest modern Orthodox synagogue in the country over the next four decades. 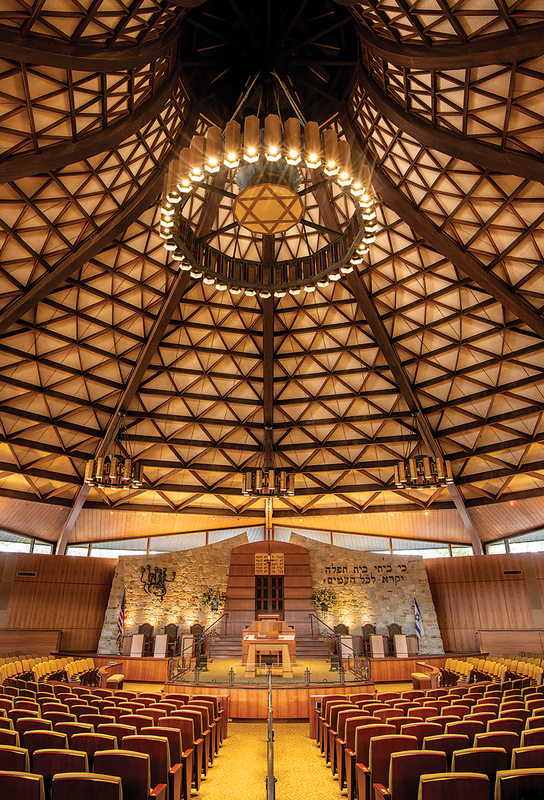 After moving to Pikesville, Beth Tfiloh’s in-the-round sanctuary, with its soaring, wood-beam, skylighted ceiling—designed by renowned Ukrainian-immigrant architect Morris Lapidus—was dedicated in 1966. But the new sanctuary contained artifacts of the old. 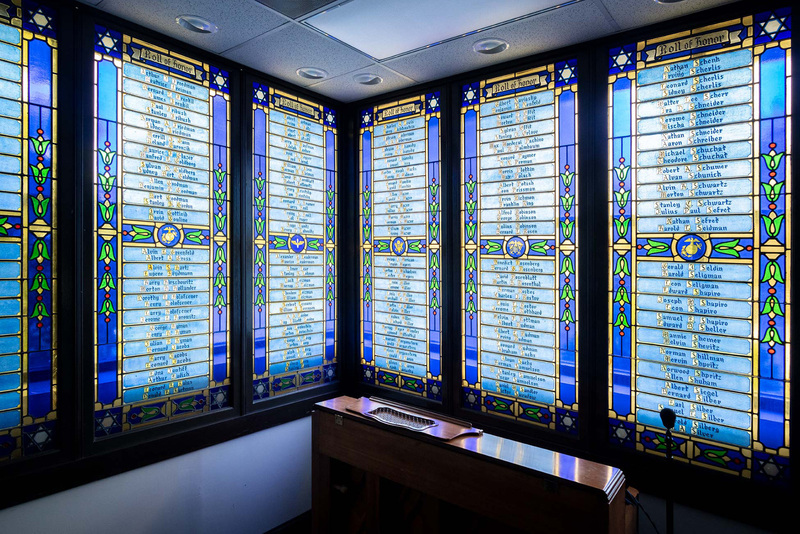 Stained-glass windows from the original Beth Tfiloh are installed in several locations and the chapel in the high school part of the building contains pews from the old synagogue, as well as the ark that held the original congregation’s Torah scrolls, which had been stashed away in cemetery storage room for decades. Finding Round Falls can be a little tricky. 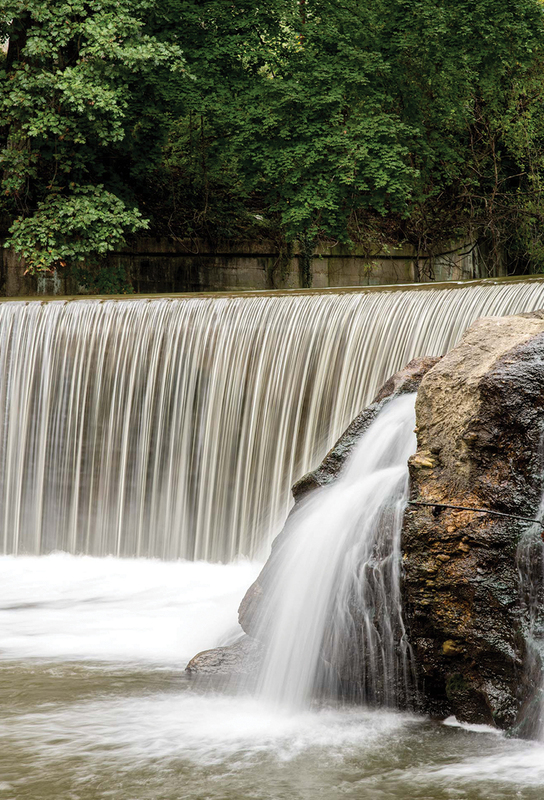 Situated along Jones Falls Trail near Druid Hill Park, the only indication that it exists is a blink-and-you’ll-miss-it wooden sign announcing the “James W. Rouse Memorial Deck at Round Falls” (a tribute to the visionary Inner Harbor developer). 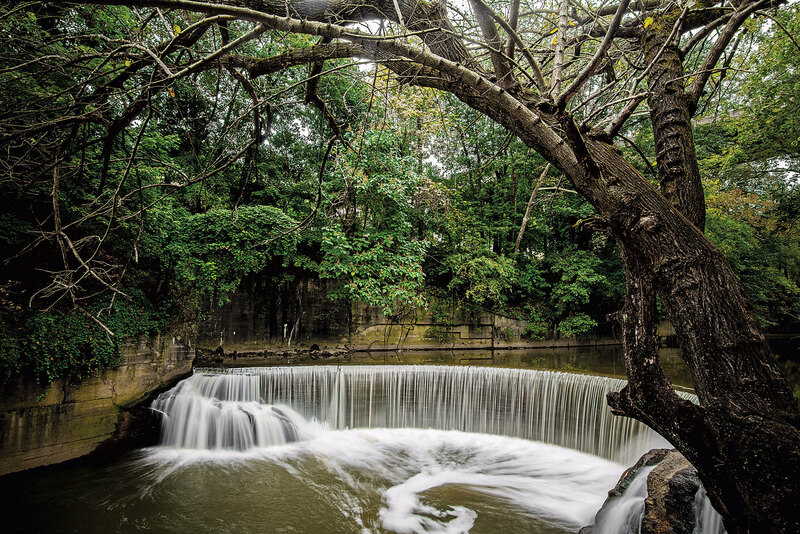 A short walk farther, and the woods open up to an expanse of the Jones Falls stream and a 10-foot-tall man-made waterfall forming a semicircle. Water rushes downward and collects in swirling patterns at its base, then flows onward. Among the large trees, gazebos, and scenic lake views in Druid Hill Park lies a burial site of sorts. 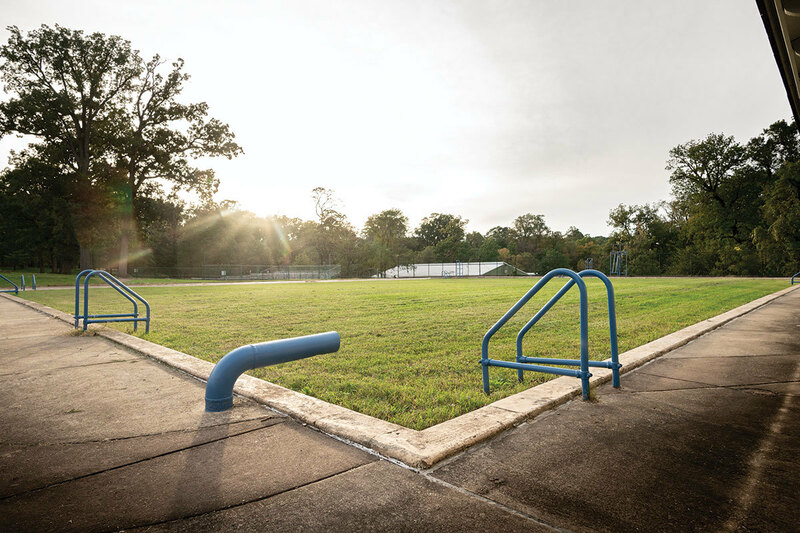 This sacred ground is an art installation created by world-renowned artist Joyce Scott, who memorializes what was once Pool Number Two, built in 1921 as the only public city pool open to African Americans. 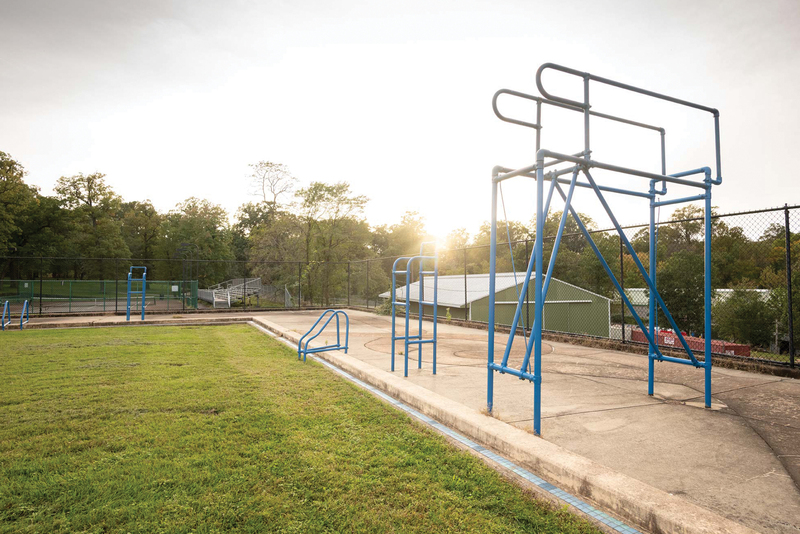 By the summer of 1956, all city pools became integrated, and the following year, Pool Number Two closed permanently and laid dormant until its transformation under Scott’s hand in 1999. Today, it serves as a necessary reminder—and place for reflection—of a shameful period in local history.